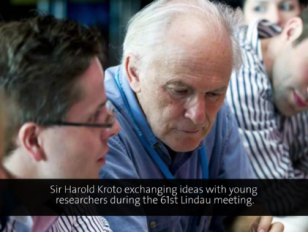 Amongst the Nobel Laureates lecturing in Lindau, Sir Harold Kroto would probably earn the award for the most unusual and characteristic way of presenting. This lecture, which is the first he ever gave in Lindau, is no exception. Kroto`s way of presenting relies on a quick succession of, sometimes loosely connected, images, which are, in a most creative fashion, gathered from the spheres of history, arts, science, society etc. This brings about a relaxed and – at the same time – enriched and intense atmosphere, which is usually highly appreciated by the Lindau audiences. (Unfortunately, there is no video available for this particular lecture and we have only the audio recording).